It appears that the roll out of iOS 10 wasn't a smooth one for some of the many iPhone and iPad users who attempted to install the latest build of Apple's mobile operating system. Some were unable to install iOS 10, and ended up receiving an error message telling them to plug their device into a PC or Mac to restore the OS. But the good news is that Apple is now saying that the problem has been fixed. 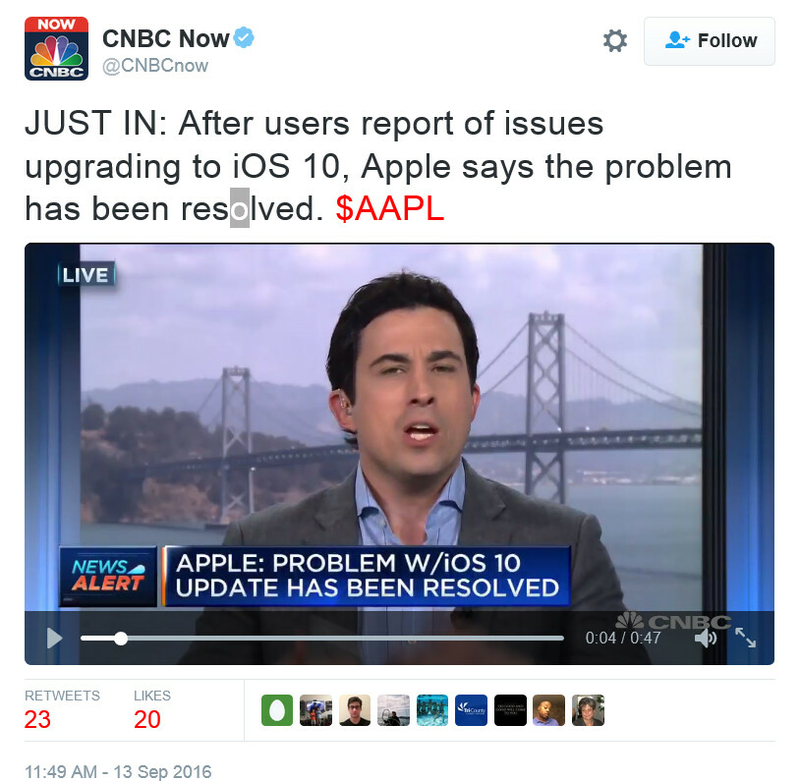 A tweet sent by business cable channel CNBC reports that Apple says it has now resolved the problem. 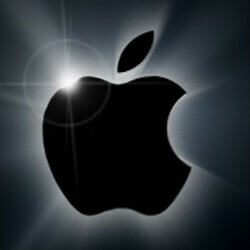 In a statement, the tech titan said that a small number of users were affected during the first hour of availability. Anyone who had an issue and can't finish the updating process, should try to complete it using iTunes. If that doesn't help, they should contact AppleCare. If this sounds familiar to you, it was back in May when those with the Apple iPad Pro were receiving Error 56 messages when trying to update their slate to iOS 9.3.2. Owners of the device were told to try to update the tablet using iTunes, and to contact Apple Support if they needed further help. Android: Lollipop has a leak.......hasn't been fixed yet. IOS: Bricks 40 phones.......fixed in two hours. 40. Hah. The Dutch Tweakers forum had dozens of reports already. That's a small community in a tiny country. Was this leak you speak of possibly fixed in Marshmallow? Or maybe within one of the monthly security updates I always get? Supposedly it was. However, further digging concluded that it is still indeed very present. It may even be in Nougat, but I can't speculate on that. There are still ongoing wakelock issues brought up by Google Services or Google Play Services even on brand new Nexus devices that are in no way carrier branded and bloated. This has gone on since Lollipop and Google is too busy adding more "features" before addressing these issues. Also, why the f**k does GMail require Body Snesors be enabled in Google services? Same s**t with location being pined for the goddamn Play Store. Then there's Doze which sometimes doesn't work as intended on a few devices. All discussion on these problems can be found through a simple search using the date function to narrow down results. The less apologists there are for Google the better Android will become. Works fine on my iPhone. Got some great features in it. Alot of people have bricked devices that won't do anything. What they fixed was to make sure it wouldn't brick anymore. Read it again, just plug into iTunes and voila - it will literally restore the device and the backup semi-automatically (you just have to click a couple of buttons). I read it. I'm looking at my friend with his bricked phone plugged in to iTunes with a loading screen. For an hour now. Consider contacting apple and see if they can assist you in unbricking your device. I will say. I use both android and ios. I've always loved ios for its prompt updates. They don't always have the best features, the best cameras. But their software is great. When they do things whether it's been done or not. It's almost always done right and better. I have always updated the minute it arived and never has an issue, just like other millions of iOS users. I wish for you - exclusive Android users - to learn the feeling :)! What's funny in all this....Google and all carriers don't have these issues...why because they don't consistent upgrades? LOL! Apple has billions of people updating to iOS10 now through their iPod, iPhone, iPads. Google could only wish to have platform continuity and consistency​ like Apple. That's one way to look at it, the other is that Apple has a relatively tiny group of different hardware configurations to support with its updates, compared to Google Android updates. Yet Apple still managed to mess up half the updates the past year and a half. Mac ready, don't act like Google is updating all the devices by itself - it also has all of manufacturers that work to update their own devices. Google just makes the software and the manifacturers just need to add their apps - that's it. Apple is one company working on its own devices. Android is hundreds of companies working on their own devices using a FREE (ad supported) OS. No excuse. These companies are abandoning their own devices - somehow it's apples fault that some devices are configured differently than the variations that Apple tested. If android manufacturers actually made updates (timely updates) to ALL their devices up to 5 years old, all at the same day, you'd see worse problems - but they don't issue updates, how can you expect any update issues if there are no updates, or by the time you actually get an update most people moved on to a newer device - you can't have water leaks if you ain't got no plumbing at all. Yeah, i sometimes look at my wallpaper on the iphone, because that's all I'm able to do with it... I can't wait to buy the 7, as I heard it has a brand new wallpaper to look at. I feel anyone can't get the mood and effects to work in messages, turn reduced motion off. You then just 3D press on the send button, and up pop the options. Staying on 9.3.3 for jailbreak. Lmk how iOS 10 is! I'm digging the update myself. Apple just needs to remain diligent and be proactive when it comes to squashing the bugs. Well said bro. You know some will mos def pop up.